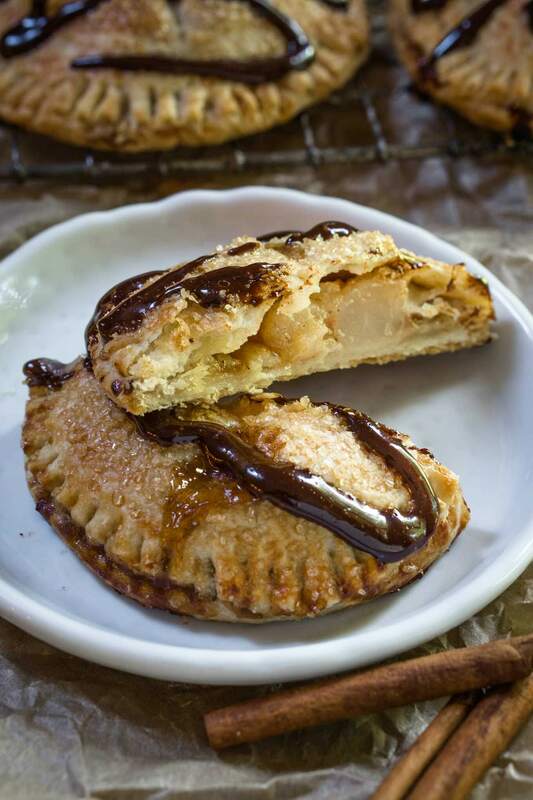 Pear Hand Pies with Dark Chocolate Drizzle are packed with pears that have been baked in a sauce of brown sugar and cinnamon between a flaky buttery crust. 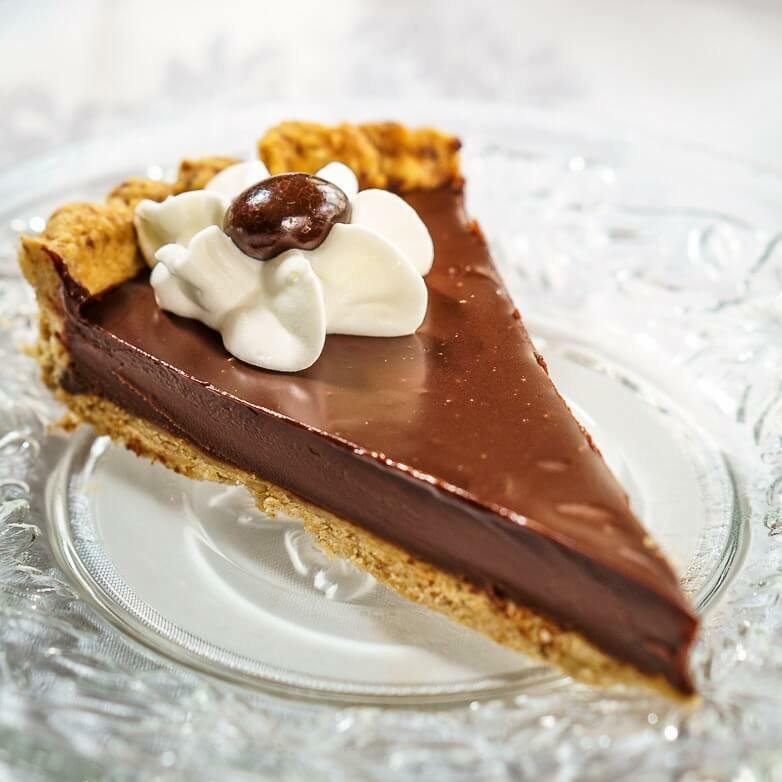 The drizzle of dark chocolate gives this pie a deeper richness. I think people are either pie lovers or cake lovers, don’t you? Me, I’m definitely a pie lover. That doesn’t mean that I would turn down a great slice of cake. If you throw in chocolate, the lines definitely get a little more blurred. 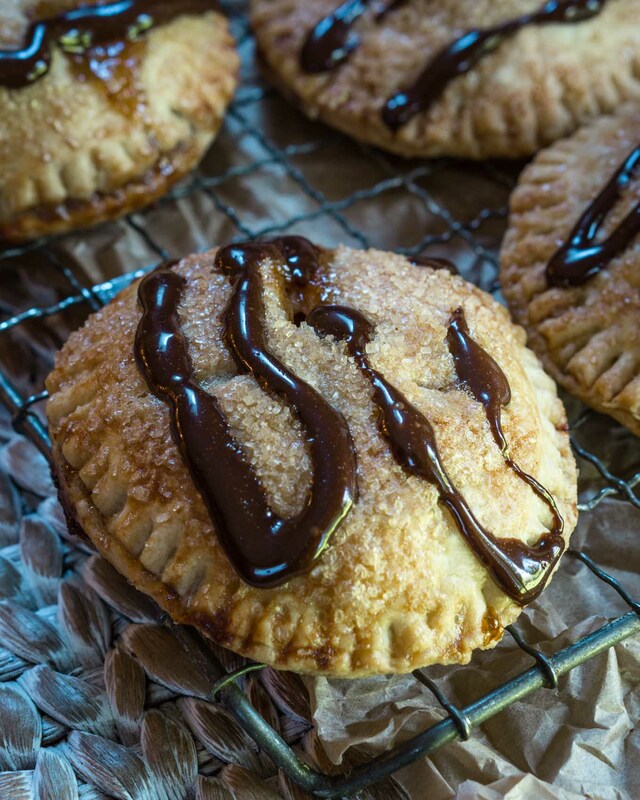 These Pear Hand Pies with Dark Chocolate Drizzle would convince any cake lover that they are definitely a pie lover. Growing up I had the largest pear tree right outside my bedroom window. I loved the pears that tree provided every year but during a storm, that tree would scrape my window making scratching noises and scary shadows. My imagination had me diving under the covers. Making individual pies guarantee that everyone gets their own serving, and I’ll take mine with a scoop of ice cream. 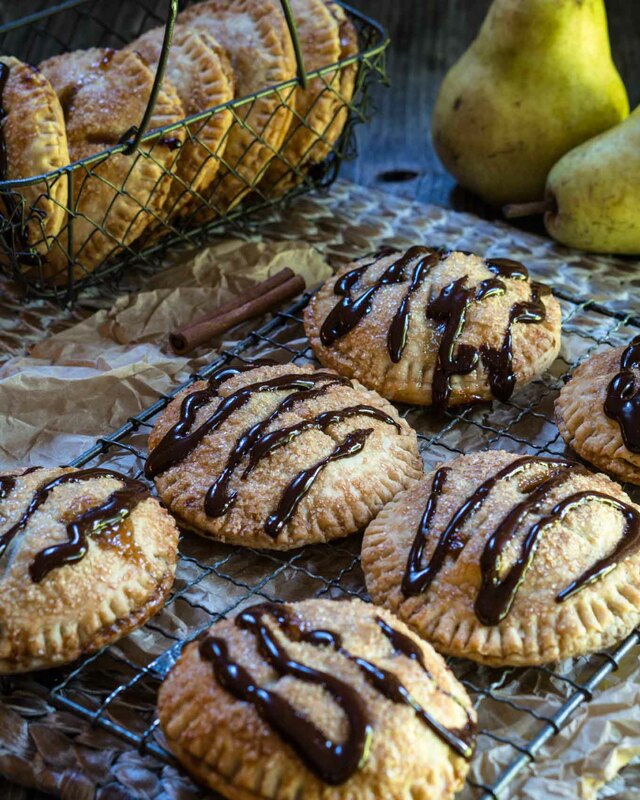 Pear Hand Pies with Dark Chocolate Drizzle are packed with pears that have been baked in a sauce of brown sugar and cinnamon between a flaky buttery crust. 4 fresh pears peeled and diced 1/2"
Preheat oven to 375°F. Spray 2 rimmed baking sheets with non-stick cooking spray or line with parchment paper. In a large bowl, combine all of the pie ingredients except the crusts. Stir together and set aside. Flour a flat working surface and roll out pie crust. Using a 4" cookie or biscuit cutter, stamp out circles. Continue combining and re-rolling scrapes to get additional circles until you have 24. Spoon two tablespoons of pear mixture (I used a 2T scoop) into the center. Wet your finger with water and run it around the bottom circle edge. Place a circle over the top and press lightly to match the top and bottom edges. Run a fork around the edge to seal. Whip egg white and water together with a fork. Brush over the top of each pie. Sprinkle with sugar. Using a knife make four slits for venting. Place six pies on each baking sheet. 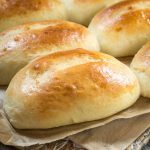 Bake for 20 to 30 minutes or until crust is golden brown. Remove pies from pan to a cooling rack. Let pies cool completely. Put cream in a glass measuring cup and microwave until hot in 30-second intervals. Pour over chocolate and stir until smooth. I put my chocolate in a small food processor, poured hot cream over the chocolate, and pulsed until smooth. Using a fork or piping bag, drizzle over pies. You can never have too much chocolate! 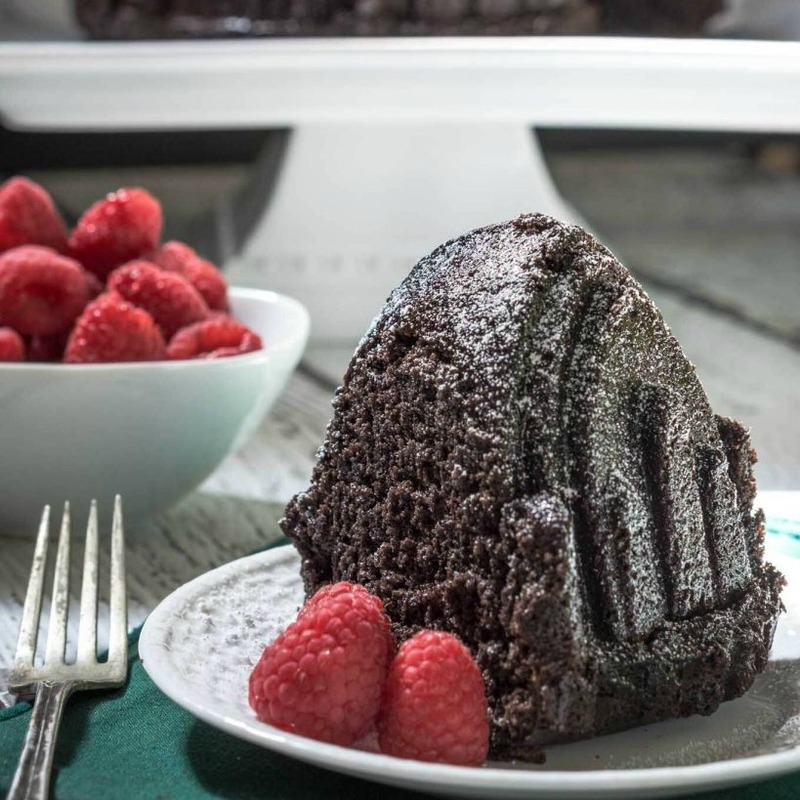 Here are a few of my favorite chocolate recipes! Those flaky crusts have me swooning. I am so impressed with your photography….the photos all look amazing! Thank you, Sandi! We really enjoyed these little pies. I would have loved to grow up with a pear tree in my garden, but I would be scared by the scratching too haha! 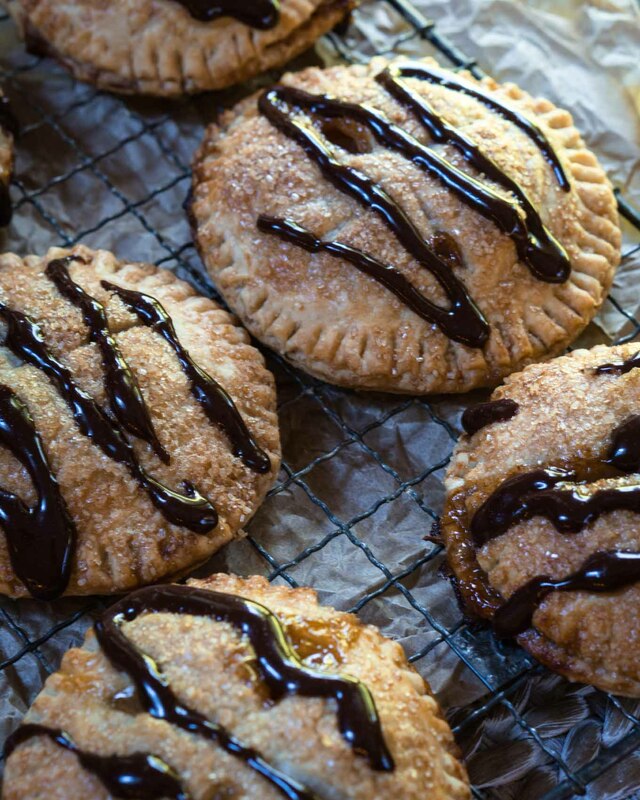 These hand pies look totally delicious, and could definitely convert this cake girl! Thank you, Michelle! I’ve always had a bit of an imagination! I’m a “whatever Julie makes lover” Pies, cake, bread…. every single thing you make goes on my to make list. 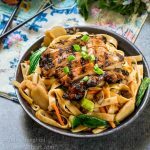 And each recipe Ive tried has been a real crowd pleaser at my house! Pinned this! Thank you Michele! 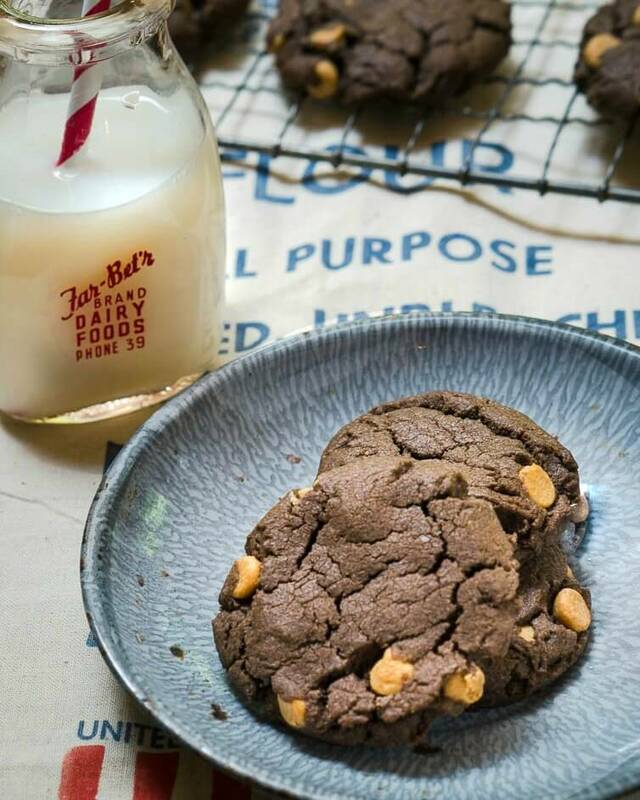 You are such a sweetie and I’m happy that you’ve tried some of my recipes! Ooooh hm it’s tough but I think I’m in the cake camp. However, these hand pie may convert me! That chocolate drizzle is just to die for! You know. . .I have to say that I could not pigeonhole myself as a cake or pie lover. I feel each has it’s own time and place. . .and sometimes I want a light & fluffy cake while other times I want a juicy pie. That being said, I think I would be game for one (well. . .probably more) of these beauties pretty much any time. As for that pear tree outside your window. Jiminy crickets! I don’t think I would ever be able to sleep. Ha! Thank you Lynn. I agree that there are just some times when yu have to have cake, pies or heck I’m open for a cookie anytime! I’m still at that indecisive stage so I have to keep sampling pies and cakes in rotation. I’m not sure I’ll ever be able to make a firm conclusion, but these cute pies are fighting the pie corner well. That little drizzle of chocolate on the top has me wanting to reach in and take one. Ha Jane, I like your thinking. All for the good of research right? Thank you my friend! Cakes aren’t much of a temptation, but oh my, your hand pies are calling my name! I love everything about these, from the flaky crust and pear filling to that gorgeous chocolate drizzle… C’est magnifique! Thank you Tamara! I’m with you girl. I’m more pie than cake. Throw chocolate into the mix and I’m a goner! 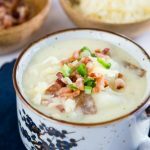 Boy would I be in trouble with this recipe! I have a feeling I would go up a pant size because I couldn’t stop at one! Thanks for the temptation Julie! Thank you Michelle! They were really good, and sometimes you are better off when they’re gone! I have not baked with pears much this Fall but your recipe is giving me inspiration to do so. I just saw a recipe with pork tenderloin and pears (not the typical apples) which sounded good 🙂 Love the finishing touch of chocolate! Thank you so much, Judi. They were really good. John skipped the chocolate and put the rum sauce that I’d made for the peach upside down cake on them. I think he’s going to go through withdrawal now that it’s gone. Have a beautiful weekend. We are having wonderful fall weather. I love the combo of pears and chocolate!! What fun pies for this time of year. So tired of pumpkin! Thank you Jennifer! I love taking a pumpkin and apple break and a perfect pear is so yummy. You had me at “pear” 😀 Can’t wait to try these! I could stuff my face with these, Julie! I know Debbie! Thank you. John drowned them in that rum sauce from my peach upside down cake. Thank you Marisa! I’m weak with both I fear! Julie, you and I have had baked pears on our minds this week. One bite of that crustiness and the soft interior will send me to pie heaven 🙂 I like the circular shape, when I’ve made these, they’ve been semi-circular. That chocolate drizzled over is so very tempting. Great job with your pictures too, they have a dramatic effect and draws the eye right in. Thank you Loretta! I think I liked the circles too so you get twice as much crust. This is perfect pie season! Thank you Jess! If I have the choice it’s pie. But if it’s only cake I’m not walking away I fear. Thank you so much Lynn! I sure love seeing those babies of yours grow. Your pear hand pies look great and I’m sure they are delicious. And with the dark chocolate drizzle…oh my! Thank you Ana! I really love pears and you know me and chocolate! 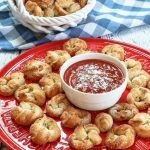 They are so delicious Sonal! Apples would work wonderfully too. Enjoy your day Sonal!